After taking many years off to raise three children, my attention now turns back to my career and to supporting my 86 year old mother with advanced dementia and my 83 year old mother-in-law who is gradually losing her independence. Like many in our generation, as my husband and I plan for retirement and slowly learn to live as empty nesters, we are sandwiched between aging parents who need care, and children who continue needing help in adulthood. This sandwich effect is simply a reality of life, with more than two million Canadians balancing childcare, eldercare and challenging careers simultaneously. While eldercare is not unique to our generation, it is now more often done by families with two full-time workers who are caring for a generation with a much greater life expectancy than those before them. Meanwhile, our children are leaving home at a later age and have a tendency to return. Caring for multiple generations at once can impact several aspects of your life: work performance, physical health, sleep, social life, downtime, and stress. This added stress can lead to poor health, anxiety and even depression. COMMUNITY RESOURCES: Enlist the help of groups that provide information, education and support, home care, private nursing services, companion services, handyman and cleaning services, day programs, respite services and counseling. FAMILY: Call a family meeting or send out a group email to organize any help or support you can get. Make a list of all the duties and ask everyone to choose how they can help. 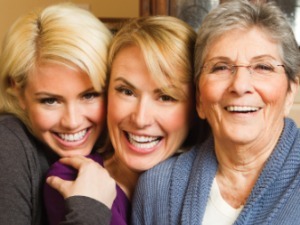 YOUR HEALTH CARE TEAM: Turn to your Copeman Healthcare team for help management your stress, sleep problems and other physical and mental challenges caused by caring for multiple generations. They can also assist you in finding appropriate support resources in the community. Be open about your situation, and your team will be there to help you through it. OPEN THE LINES OF COMMUNICATION: Talk to your parents and grandparents before they become dependent to determine their wishes for seniors’ care, end of life care and funeral arrangements. Document their wishes by ensuring they have a designated power of attorney, personal directive and will in place. This will reduce stress later on when you have to make decisions. These discussions may also open the door to discussing your own wishes with your children. SET LIMITS: Set rules, limits and responsibilities for adult children who are living with you, but also give yourself limits on what you can do while still remaining healthy and happy in life. Ask for help, let your friends and family suport you, and take time for yourself. You have many people depending on you, so it is more important now than ever to stay healthy. Schedule your annual health prevention screening, get adequate rest, eat a healthy balanced diet, exercise regularly, do activities that you enjoy regularly and live your best life.